Another week and another bar/restaurant. This week, my journeys bring me right back uptown to Las Olas Sushi Bar and Grill, but for the sake of brevity, we’ll refer to it as Las Olas for the rest of the column. Las Olas is unique in its own right because it is so versatile. Mixing sushi with a tinge of Latin flavorings, Las Olas is a restaurant first despite a sizable standalone bar in the main dining area. The place is an ideal spot for warm weather gatherings with good amount of tables on the front patio for people watching along Washington Street and an even bigger space in the garden area out back. That’s even before mentioning the fact that the restaurant’s interior is surprisingly huge. Perhaps no spot in Hoboken uses their space more effectively than this one. The décor has sort of a fresh, aquatic feel to it- from the sky blue bar color to the fresh fish being sliced and diced all around you. And although you might not necessarily think to pair a “Chimichirri Skirt Steak” ($25) with Sashimi a la Carte, nothing on the menu seems out of place once you’re seated inside. In fact, you find yourself more overwhelmed with options to choose from. Dropping into Las Olas on a Monday, I found myself in the midst of their best day for weekly specials. With $3 Asahi draughts and $5 margaritas all day long, it’s easy to get a good buzz going without emptying your entire wallet. But Saturday aside, Las Olas delivers value all week long. We’d advise you to stop in on a Tuesday for their $2 Coronas and $3 Sapporo draughts served all day. My party and I grabbed a table as we had worked up a bit of an appetite and opted not to sit at the bar. So we had a few pops, had a solid meal, and paid our check, hoping that next time we’ll grab a seat outside and enjoy more of what the uptown neighborhood has to offer. Preconceived notion – A strange smattering of food meshing the worlds of Latin fare with sushi rolls. Bar Type – An eclectic restaurant with a standalone bar. Crowd stereotype – Mostly small groups of friends or couples in their early 30’s dining outside in front and back. Music – Energetic crowd noise rather than music, with a focus on the big screen TV nearby. Value – Unbeatable values depending on which day you drop in. Again, $2 Coronas?!?. Date – Absolutely a good bet. A perfect sushi spot even for someone who doesn’t care for fish (I’m looking at your picky date) and an even better one for people who do. Hookup – Go to a bar or a lounge, you clown! Catch up with a friend – Ideal spot for this. First or last drink of the night – Stop in for a first drink, have some food, and then head out to some local spots. 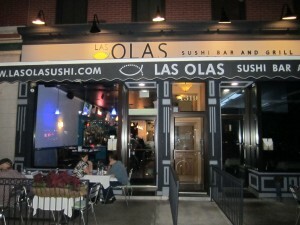 Overall – Another in a recent trend of restaurants with a standalone bar, ignoring the food being served is difficult but it shouldn’t necessarily impact the results of my journey whichis strictly ‘to have a drink at each bar in Hoboken.’ That said, Las Olas is a very cool spot with great space both inside and out and serves up some awesome drink specials night in and night out. If you want a bite to nosh on, even better. The place is a solid one (and one we would advise you to stop in to), but looks aisde, the bar itself gets a 7.9.